Cross the Fort Duquesne Bridge to Rt 65 north (Ohio River Blvd). Go 15 1/2 miles to Ambridge. At the red light at the 4th St intersection, turn right and go one block to Park Rd. Turn right, go 2 blocks, and turn left onto 2nd St. Go 1 block to Maplewood Ave. The Church is on the corner of 2nd and Maplewood. Approximate travel time: 30 minutes. From the airport, take the Beaver exit onto Rt 60 north. Go 5 miles to the Hopewell exit (#9). After you exit, bear right onto Rt 151 east. Go approximately 3 miles; Rt 151 will end at the bottom of the hill. At the stop sign, turn left onto Rt 51 and go 1 1/2 miles. Exit left to the Ambridge/Aliquippa Bridge and cross the bridge. At the third light, turn right onto Duss Ave. Go 2 lights, and at the second light make a slight left onto Merchant St. Go 1 block and turn right onto 2nd St. Go 1 block to Maplewood Ave. The Church is at the corner of 2nd and Maplewood. Approximate travel time: 20 minutes. 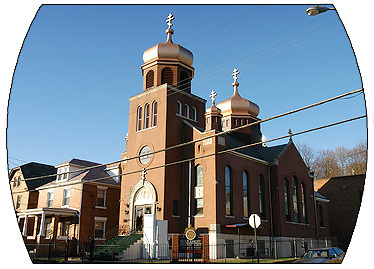 10:00 AM Divine Liturgy (9:30 AM from June through August). 9:30 AM Divine Liturgy (10:00 AM on Christmas). 3:00 PM Vespers; 7:00 PM Matins.